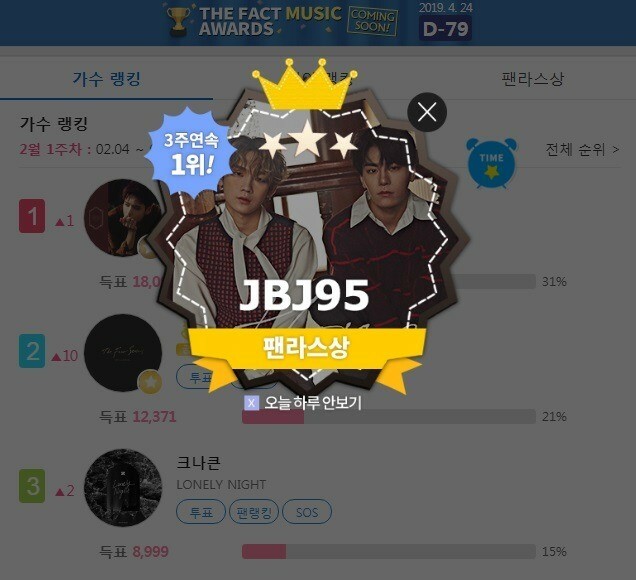 JBJ95 got the first place in the third straight week of the fan and star. [The Fact] Duo JBJ95 got the first place in the third straight week of the fan and star. JBJ95 got 1st place with 307,405 votes for the FAN N STAR award In the fifth week of January, which ran from April 28 to 4. Followed by golden child got 2nd place for the award with 298,457 votes, and Oneus got 3rd place for the award with 12,945 votes. The candidate is chosen by FAN N STAR and targeted at artists with the potential abilities. Any artist who is growing steadily with unique musical activities regardless of his or her debut year, gender and age can be nominated. If you take first place of ‘RISING STAR AWARD’ for five consecutive weeks, will be given special benefit. First, they are going to be announced the news on The Fact websites of South Korea, Japan, and China. The one who got ‘RISING STAR AWARD’ can hear the good news from abroad, and It will also be given an opportunity to become a global artist by informing foreign countries of the award. Especially they will be nominated for the 'The Fact Music Awards' on April 24. And the video clips celebrating the award will be shown in the waiting room of 43 stations of subway line No. 2 in korea. The trophy will be presented directly to the winner.